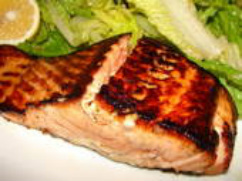 Eating salmon or other fatty fish twice a week provides major heart-protective benefits associated with omega-3 fatty acids found in fish oils, according to the American Heart Association. Use these creative recipes to start incorporating more of this healthy fish into your weekly regimen. 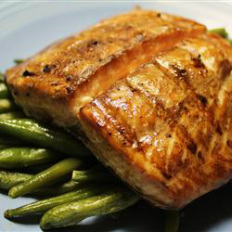 "A simple soy sauce and brown sugar marinade, with hints of lemon and garlic, are the perfect salty-sweet complement to rich salmon fillets. Even kids love this recipe!" Per Serving: Calories 497; Total Fat 33 grams; Saturated Fat 6 grams; Protein 30 grams; Total Carbohydrate 19 grams; Sugar: 15 grams; Fiber 3 grams; Cholesterol 78 milligrams; Sodium 457 milligrams. 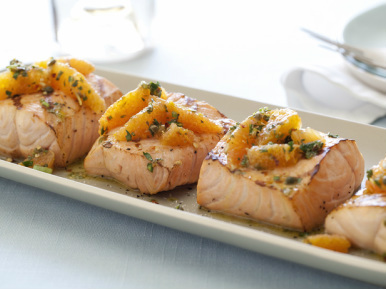 Arrange salmon in a single layer on a jelly-roll pan coated with cooking spray. 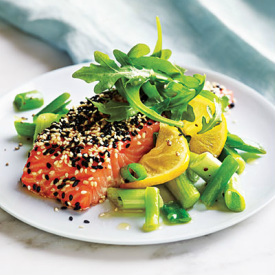 Combine sesame seeds and 3/8 teaspoon salt; sprinkle evenly over flesh sides of fillets, pressing gently into fish. Bake at 400° for 14 minutes or until desired degree of cooking. Pan-Roasted Salmon with Soy-Ginger Glaze. Notes One Serving 348 cal, 21 gm fat, 4 gm saturated fat, 2 gm carb, 0 gm fiber.